Any self-respecting SaaS founder in today's industry will tell you; don't even think about putting your customers on the back burner. That's why it's shocking that most SaaS companies ignore the most important things about their customers. When you don't pay enough attention to your customers, you sacrifice any understanding of who they are, and forego huge opportunities for customer acquisition, retention, and revenue growth. You're wasting time and money, working hard to please customers you don't truly understand and getting nowhere. Knowing your customer means being able to pick out any customer and identify what value they're looking to gain, what features they think are most important, and what they're most willing to pay. Only by understanding these fundamental components through direct communication and quantitative analysis will you truly be able to put the customer first and reap the benefits of a customer-first mentality. Everyone likes to think that they know their customers, but thinking about them and knowing actionable insights about them that make up quantified buyer personas are two very different things. Unfortunately less than 50% of SaaS companies that we surveyed are doing anything more than spinning their wheels and speculating. Over 55% of SaaS companies—the majority—said that they have “thought about” their customers. Around 35% of SaaS companies have a central document that they use to describe their customers, and under 10% have actually quantified their buyer personas. About 90% of SaaS companies are missing out on real opportunities to improve marketing, support, sales, and bottom-line revenue. Without knowing different customers' needs and wants, your marketing will suffer because you won't be able to direct customers to features and price points that are right for them. Customers won't understand your product's value proposition and won't be able to pay for the value that they want. A lack of quantified and specific customer information will leave your company marketing to the wrong customers, which leads to fewer conversions. When you don't understand what your customers are really looking for, you won't communicate value correctly to potential or existing customers, which leads to higher churn. This takes effort, but that doesn't mean it's difficult. In fact, you can—and should—start today. Our framework involves three steps: market research for value, relative feature preference analysis, and price sensitivity analysis. 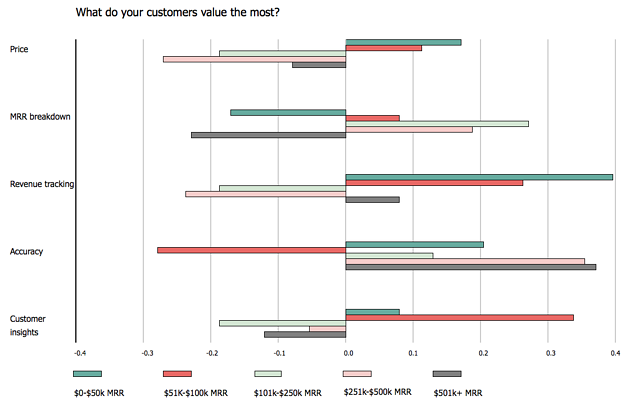 What value do customers find in your product? Your product's value proposition attracts potential customers to your product and drives them to convert. Without knowing who your customers are and what they're looking for, you'll never be able to tailor and communicate the right value proposition. SaaS customers aren't all identical grey figures sitting in front of computers, searching for software. They are unique people trying to solve problems for their companies and make their own lives easier—and better serve their own customers. This information will help you to create your initial rough sketches of buyer personas—the framework that you'll then fill with rich details. Why do you want to use our product? 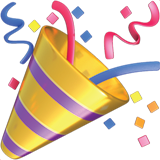 How did you find out about our product? What problem will our product solve for you and your team? Then tailor your questions to find out more about what's most important to your company for your product. 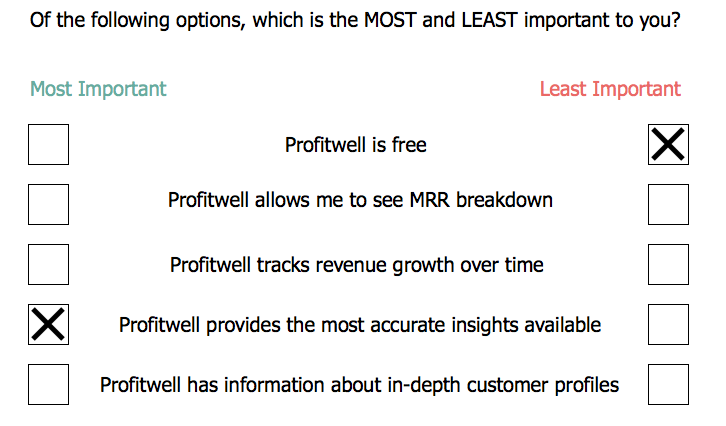 For instance, when we built ProfitWell we asked our customers about their team size, their revenue, and how often they looked at their metrics. There's no limit to how much information you can pull on customers, and the more you know the better you'll be able to build a powerful and profitable tool. To maximize your understanding of your customers' identity and, by extension, their perspective on your value proposition, you can use tools that automatically pull information. 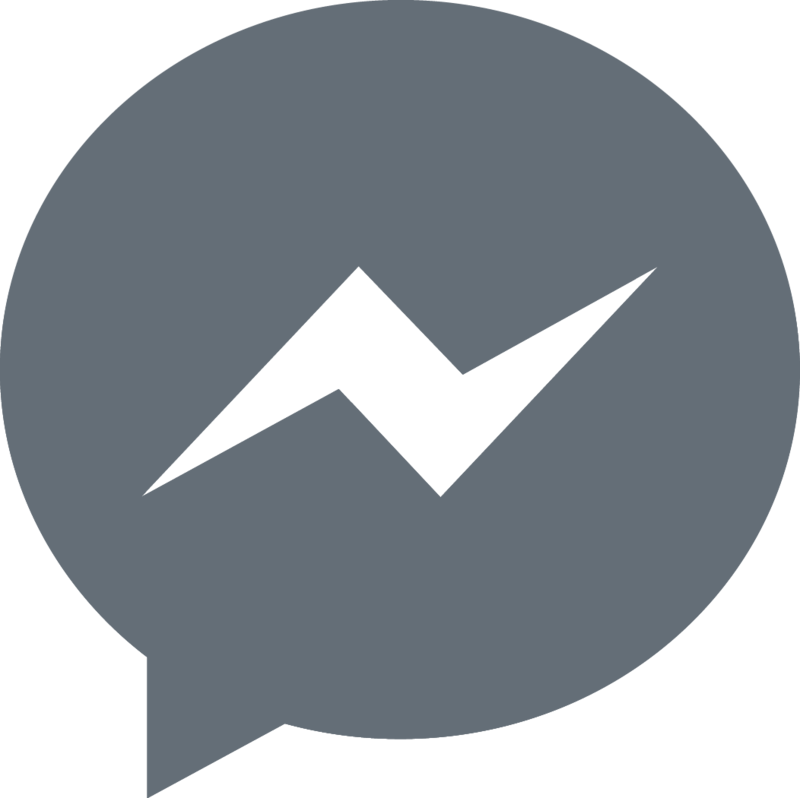 A tool like Clearbit will allow you to easily gain rich information on your customers that will contribute to your understanding of who they are and why they want to use your product. Similarly, collecting user behavior data and finding behavioral patterns can help you understand your customer's experience and intent with your product. Tools should always be used in addition to direct communication. Once you have this information, you simply have to sort and group similar customers to begin loosely defining your buyer personas. What features are most important to your customers? Once you've realized that different types of customers are inspired by different value propositions, you'll start to see that they also care about some of your product's features more than others. 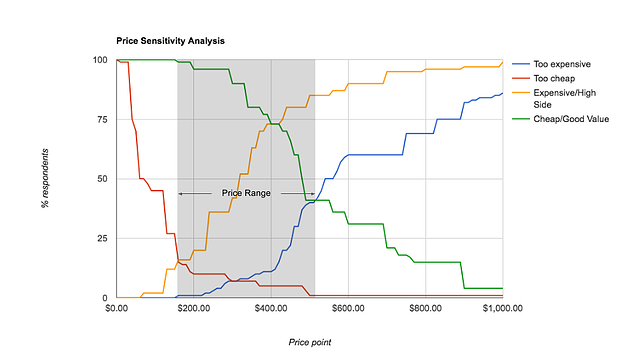 Price strategy: Create your packaging for different tiers based on the features that are most important to different buyer personas, and then position them along a value metric. This will help your tiers capture the most value for that section of the market. Marketing strategy: Highlight the features that are most important to particular buyers when reaching out to them through outbound marketing channels—for example, AdEspresso advocates for using buyer personas to optimize your social media targeting. You can also emphasize these features when communicating with potential customers in the sales funnel. Revenue growth: Targeting the features that are most valuable to particular customers is what drives potential customers to convert and current customers to upgrade to higher plans. Identifying your customers' most and least favorite features begins to add the definition and depth to your buyer personas that you need. Feature surveys have a bad rap because they can be confusing for both the customer being surveyed and the surveyor. For example, surveys often ask customers to rank a feature's usefulness “on a scale of 1 to 10.” This forces the customer to make an arbitrary judgement and leaves the surveyor with abstract information that is difficult to use constructively. Open-ended questions about favorite and least favorite options are even worse. Customers might not even be aware of all of your product's features, or they might incorrectly describe or misinterpret a feature. Either way, the surveyor is again left with unhelpful information. Instead of guessing, you can make informed decisions about your pricing and marketing strategies that are supported by cold, hard numbers. For example, packaging in your pricing tiers should place revenue tracking in lower-priced plans for those lower-MRR bracketed customers. Now you also know that you need to emphasize accuracy in your copy to your enterprise tier to make sure you're attracting those high-value customers. What are your customers willing to pay for your product? Customers' price sensitivity, or willingness to pay, is the most important component of your pricing strategy. A study at Harvard Business School revealed that a 1% improvement in pricing can improve your revenue by 11%. For comparison, our study found that a 1% improvement in acquisition improves revenue by less than 4%. Price sensitivity is your customers' perspective on the exchange of value between price and product. If you're not harnessing this to shape your pricing strategy then you're ignoring a huge growth lever and missing out on cash. Willingness to pay doesn't just depend on the size of your customer's team or their MRR—it also depends on what problem they're looking to solve, how they want to scale with your product, and what features they're most interested in. That's why you can't just guess at customers' willingness to pay. You have to ask them directly. The number one thing about your product that matters to your customers is the degree to which it helps them solve their problems. That's what they want to pay for. Seeing your product's value through the eyes of your customer will help you understand how to set your pricing so that it aligns with their perspectives. You can then determine the price range, and ultimately the optimal price point, at which the price would cause the least amount of sales to be dropped. 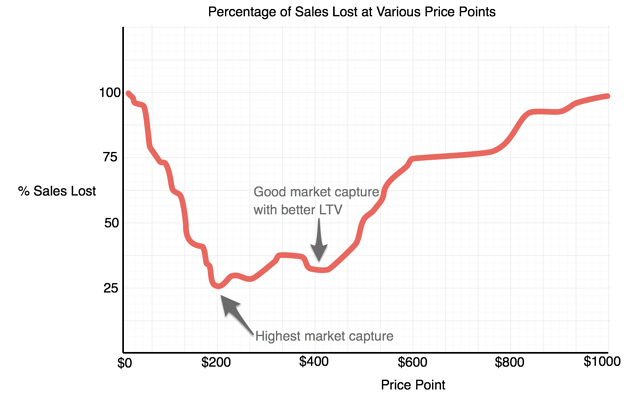 For example, this data shows that the least amount of sales lost / the highest market capture is at $200. Yet a $400 price point captures almost as much of the market and creates potential for higher LTVs for these customers. 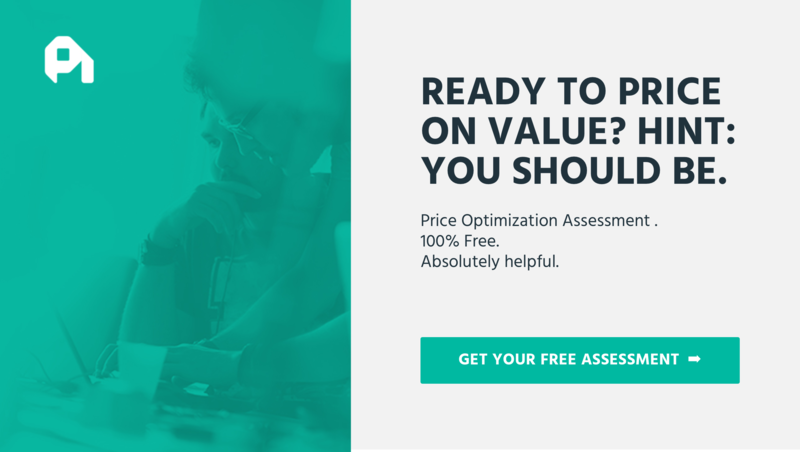 This is how you'll optimize your prices to drive the most sales for each buyer persona. “Know your customer” isn't a phrase that is meant to sound fluffy or falsely altruistic. When you take steps to quantify your buyer personas, knowing your customer is a strategy that will deliver tangible improvements to customer relationships, company growth, and bottom-line revenue. When you don't take these steps, you're setting your company up to fail. 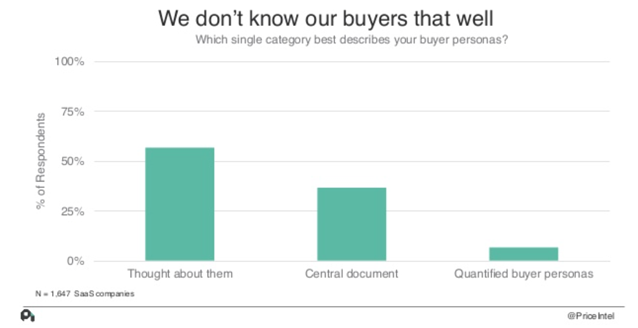 There is no limit to how specific you can get with your buyer personas. Calculating the CAC and LTV for each persona will help you understand these buyers even more and will allow you to make even more informed decisions when push comes to shove. Segmenting customers by marketing channel will improve the effectiveness of your outreach. 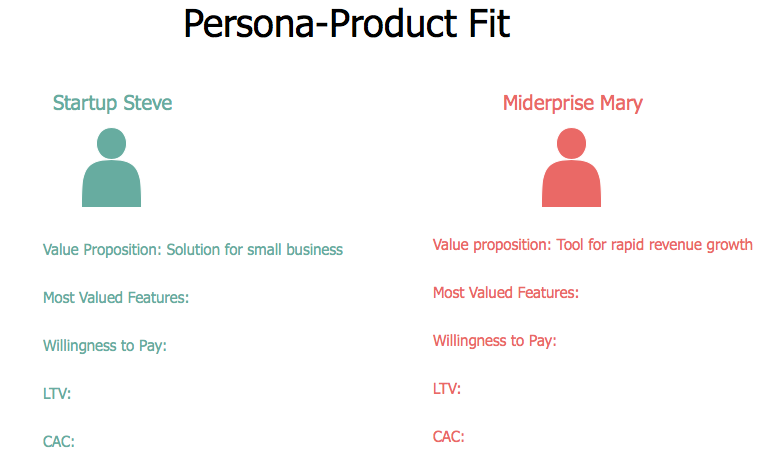 The key is to start quantifying your buyer personas today for the best understanding of your product—from your customer's perspective.